In July 2017 the Australian Government’s changes to super meant that transfers from super to pensions are now capped at $1.6million, previously there had been no limit. Concessional (before tax) and non-concessional (after tax) annual contributions limits have also decreased, meaning that if you’re looking to grow your wealth in a tax effective way, you may need to look elsewhere. Investment bonds are a tax effective, highly accessible and popular vehicle for people who want to grow their savings outside the superannuation system. They are worth considering particularly if you’re a high income earner or have a Self Managed Super Fund (SMSF). Why? Because the limitations and constant changes to super are becoming frustrating and confusing to those looking for tax effective ways to build wealth. Having investment bonds running alongside your super is a way to not only preserve and grow your personal wealth in a tax effective manner, but to also remain in control of it. 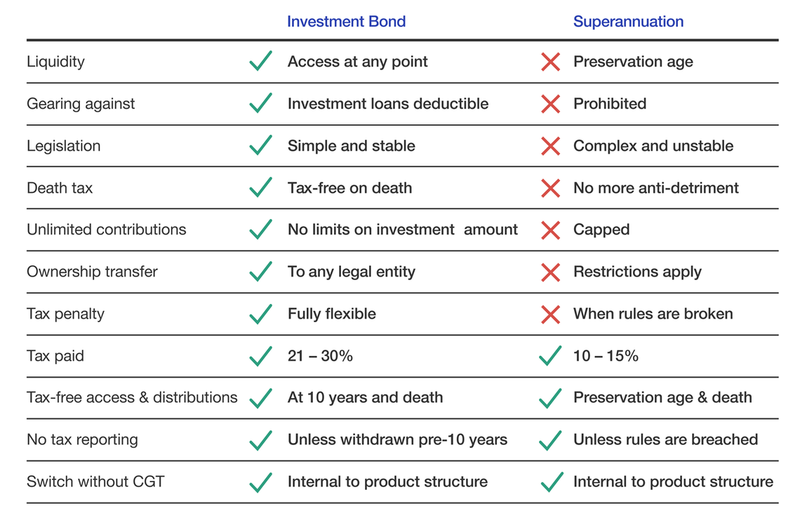 Similar to superannuation, investment bonds offer a tax paid structure where tax is paid within the investment bond, rather than by the investor. The maximum tax paid on the earnings and capital gains within an investment bond is 30%, although this can be even lower after franking credits and tax deductions are applied. This makes them an attractive investment option for high income earners who usually pay up to 47% income tax. Another key feature of investment bonds is that if the investment is redeemed after 10 years, no personal tax is paid by the investor. This is known as the 10 year advantage. Unlike superannuation, an investment bond has no restrictions around who can invest, how much can be invested or even when money can be accessed. To access your funds there is no preservation age, retirement or purpose test required. If you leave your funds in an investment bond for 10 years, you will not only see your wealth grow, the entire proceeds of the bond (original investment, additional contributions and earnings) will be tax free. You don’t need to include them in your tax return and, should you want to, when you need them, they can be paid to you as a lump sum. Unlike superannuation, investment bonds give you much greater flexibility on how much you can contribute to your investment. There are no limits on the amount you can invest in the first investment year, plus in each subsequent investment year, additional contributions up to 125% of the previous year’s contributions can be made without resetting the 10 year advantage. The great news for tax purposes, is that these additional contributions benefit from being treated as if they were invested at the same time as your initial contribution. Scenario: Anna is 55 years old and is on the highest marginal tax rate of 47% and expects to earn $250,000 p.a. Anna has recently sold down her investment property with net proceeds of $300,000 received. Anna’s superannuation contribution limits have been capped out but she wants to invest surplus income of $10,000 p.a. for the next 10 years to continue to build wealth alongside her superannuation. Anna is looking to reinvest her property proceeds and surplus income in a tax effective manner. Anna invests her investment property proceeds of $300,000 into an investment bond and contributes an additional $10,000 each year via a regular savings plan. By age 65, Anna will have contributed $400,000 which she would not have been able to contribute into her superannuation because she has reached her contribution limits. Her investment bond will have reached a value of $709,533 after 10 years. Anna can redeem her investment after 10 years and pay no additional tax on the proceeds. She does however have the flexibility to access her investment bond benefits prior to her intended retirement age.